Tag line: "She's a girl from the big city. He's a reckless soldier of fortune. For a fabulous treasure, they share an adventure no one could imagine... or survive"
When Romancing the Stone first hit theaters in 1984, some critics hailed it as the second coming of Raiders of the Lost Ark, and seeing as that Lucas / Spielberg yarn was a particular favorite of mine, I couldn’t wait to check this flick out. Well, Romancing the Stone wasn’t Raiders, but to be honest I didn’t care; it’s an adventure / romance with great characters and a whole lot of heart, and I had a hell of a time watching it. Unlike the heroines in her romance novels, who battle villains and ride off into the sunset with the handsome hero, best-selling author Joan Wilder (Kathleen Turner) leads a quiet (read: dull) life. That all changes, however, when she receives a package in the mail (sent by her recently murdered brother-in-law) that contains an ancient treasure map. Moments later, Joan gets a frantic call from Cartagena, Columbia: her sister Elaine (Mary Ellen Trainor) has been kidnapped by a pair of thieving cousins named Ira (Zach Norman) and Ralph (Danny DeVito), and if she doesn’t fly the map to Cartagena immediately, she’ll never see dear 'ole sis alive again. But Ira and Ralph aren’t the only ones interested in finding the treasure; the ruthless Zolo (Manuel Ojeda), commander of the Columbian secret police, also has his eyes on it, and when Joan (who gets on the wrong bus after arriving in Columbia) finds herself stranded in the middle of the jungle, Zolo makes his move, pulling a gun and ordering her to hand over the map. It’s then that Jack Colton (Michael Douglas), an American expatriate trying to eke out a living in Columbia, happens by. Following a tense shoot-out, Zolo heads for the hills, and Joan, desperate to save her sister, offers Jack $375 in Travelers checks if he’ll take her to Cartagena. Thus begins an exciting adventure, with Jack and Joan battling snakes, the elements, and each other as they wind their way through the jungle, one step ahead of Zolo and his army. And while the abrasive and often rude Jack isn’t exactly the man of her dreams, Joan finds herself falling in love with him all the same (though she’s not 100% convinced that he can be trusted). 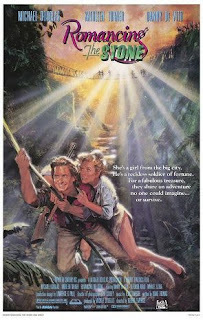 Without a doubt, Romancing the Stone is an exciting movie; the entire jungle sequence (where Jack and Joan are pulled into a mudslide and, a little later, make like Tarzan to escape Zolo) is damned entertaining. And thanks in large part to Danny DeVito’s Ralph, who’s also tracking our heroes on the road to Cartagena, there’s plenty of comedy as well (his angry phone calls to Cousin Ira are hilarious). The film’s strongest suit, though, is the chemistry that develops between its two leads. As it is with most cinematic couplings, Joan and Jack have nothing in common at the start: she is an introverted writer from New York City who dreams of adventure yet has never experienced it; while he is a free spirit hoping to scrape enough money together to buy a sailboat, then sail it around the world. But in the capable hands of Turner and Douglas, the “opposites attract” storyline doesn’t seem quite so cliché. Toss DeVito’s obnoxious kidnapper into the mix and you have three endearing characters you don’t mind spending a few hours with. In the years that followed Romancing the Stone, Devito, Turner, and Douglas would reunite for two more films: 1985’s The Jewel of the Nile (a sequel to this movie) and the underrated black comedy The War of the Roses. And while both of those later films have their strengths, it’s Romancing the Stone that shows the trio at their absolute best.